The property can be found just below Joffre Square, a popular meeting place and viewpoint onto the harbour. The town centre can easily be reached within five minutes by a tuk-tuk or by a 15-minute walk. 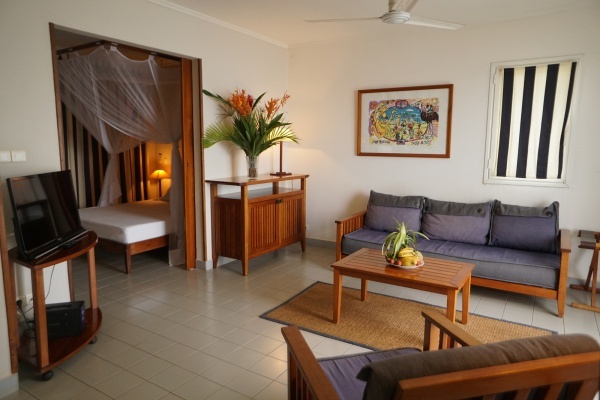 The hotel includes 12 Premium Suites with sea view and 20 Standard Suites with sea and/or garden view divided between several two-storeyed white concrete buildings set amidst a well-maintained tropical garden with coconut palms and allamanda bushes with their beautiful yellow flowers that bloom year round. The 24m² Standard Suites are divided between four buildings with either a balcony or garden terrace. Each room has a double bed or two single beds. The 38m² Premium Suites are divided over three buildings, with each building having two suites upstairs and two at ground level. 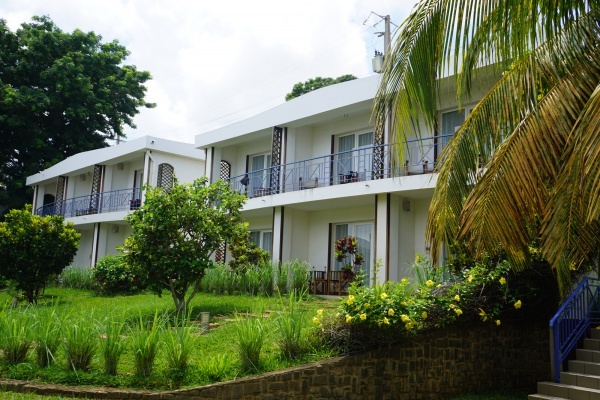 All rooms are optimally furnished and offer a private balcony or terrace, bathroom/WC, air-conditioning/ceiling fan, large cupboards, telephone, satellite TV, Wi-Fi, minibar/fridge and tea-/coffee making facilities and a secure safety box. Both Premium and Standard Suites have a writing desk with a large mirror which can double as a working space and make-up desk. 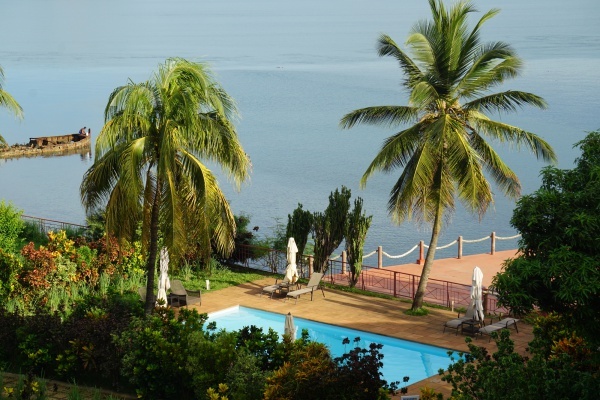 From the buildings at the front, guests can enjoy an early sunrise above the bay and the never ending sound of waves. Visible in the far distance towards the north is Windsor Castle and towards the east is Ramena and the passage to the bay. The pier in front of the 11x5m pool was not built to receive ships but is a special venue for wedding receptions, photo sessions and selfies. It is also a very peaceful place where one can enjoy a few moments of calm in the early morning hours, watch fishing boats sail by or gaze the stars at night. 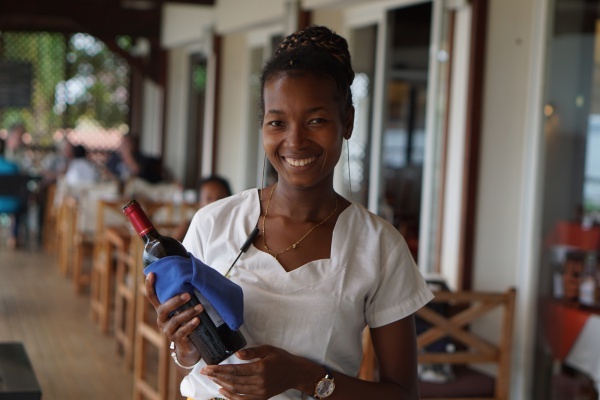 The restaurant, Le Melville, has besides an inside seating area a large terrace overlooking the grand bay and Cap Diego which in all has room for 70 guests. Breakfast is served à la carte including freshly squeezed juices using seasonal fruits from the local marketplace, homemade jams and freshly baked pastries. Lunch and dinner offer a fixed menu, especially seafood specialties, with an always changing daily offer. At the bar, guests can choose from a wide variety of rum assortments or mixed cocktails made with fresh ingredients. The drinks can be enjoyed at the bar, by the poolside or on the pier stretching out into the ocean. 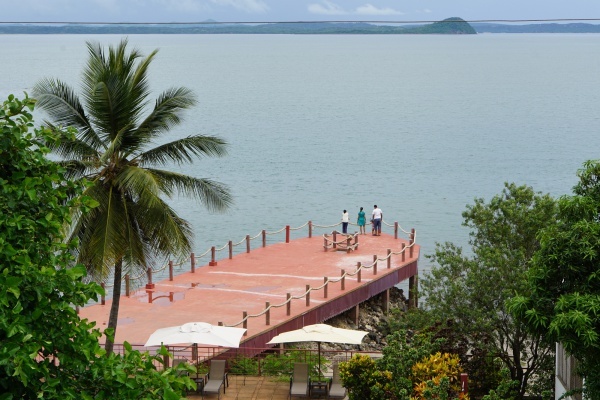 The area of Diego Suarez has much to discover. Water sport enthusiasts can dive into the rich underwater flora and fauna and relax at one of the many deserted beaches. An impressive viewpoint is the light tower near Ramena village, overlooking the one kilometre wide entry passage to the giant bay. Exploring the old harbour town of Diego Suarez with its unique architecture. 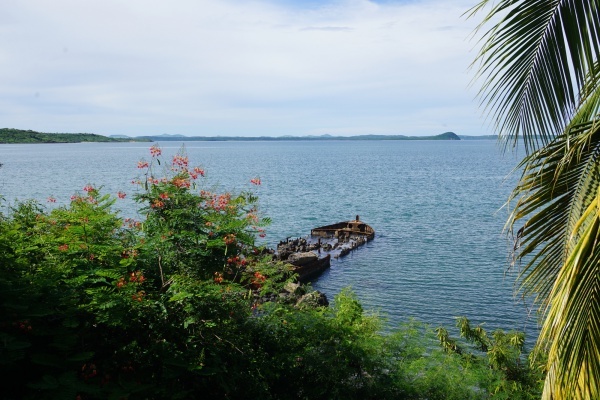 A 15 minutes boat ride to the old ruins of the former military base Cap Diego. The turquoise shining bay Mer d'Emeraude (Emerald Sea) can be reached within one hour by boat. East of Diego Suarez, near the village Ramena, are three bays with wonderful and often deserted sandy beaches: Baie des Dunes, Baie de Sakalava and Baie des Pigeons. Ascent to the peak of Montagne des Francais (Mountain of the French) with incomparable views onto the Bay of Diego Suarez and the surrounding mountains. Guided tours by quad or 4x4. Montagne d'Ambre National Park, famous for its waterfalls and crater lakes (35km from Diego Suarez). The French and English speaking reception staff at Allamanda are happy to assist you to arrange your activities. The hotel and restaurant has parking spaces and around the clock security. Reserving a table at the terrace for dinner at the popular Le Melville restaurant is usually recommended. This page was last modified on 25 February 2019, at 13:46.